This special feature webpage highlights a chapter extracted from the latest publication, the second volume of the Island's firefighting history; From Victoria to the Armistice. 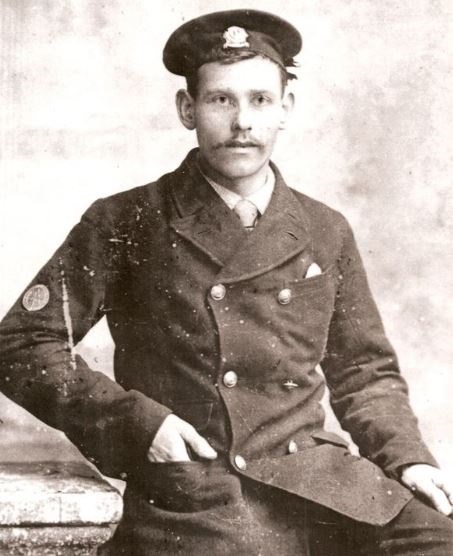 In 1894 teenaged Wilfred Harry Brown was elected by the men, as was the protocol of the time under Captain James Dore, to serve as a new fireman with the Sandown Fire Brigade having previously been one of its messenger boys (or ‘knocker up’). He wasn’t to walk out again for fifty years, five decades in which he faithfully served his town, spent two periods overseas serving his country and was guiding his station through the rigour of his third war when the vagaries of the newly nationalised fire service unceremoniously robbed him of his command. One of the earliest mentions of W.H. Brown to appear in print occurred when he was part of the Sandown team of firemen who participated in the Island Fire Brigades Federation annual drill competition which featured as an element of Ventnor’s carnival week in 1898. He represented his brigade in the two-man drill alongside Fireman Dennett (third place), in the three-man-drill with Dennett and Phillips and the four-man-and-officer drill with Dennett, Dennis, Punch and Newbury. One of the earliest images of Wilfred Harry Brown. Eighteen months later the horizons of his world must have suddenly widened when the call of the Second Boer War resonated in his ears and he boarded the vessel that took him, Sergeant W.H. 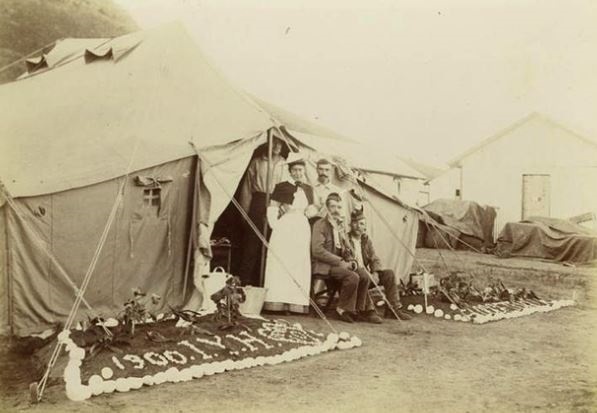 Brown of the British Red Cross Society, many thousands of miles south to serve with the Yeomanry Ambulance Corps in the area of the Great Karoo in the Northern Cape, at a hospital known by the location of the junction of the Cape Town to Pretoria railway it neighboured; Deelfontein. In December 1899 the British Army suffered a humiliating series of defeats in South Africa at the hands of an army comprising surprisingly well organised untrained farmers; the Boers. Bodies of British soldiers laid scattered across the battlefields of Stormberg, Magersfontein and Colenso. British officers at General Buller's field HQ on Gun Hill watch the progress of the Battle of Colenso, 15 December 1899. The increasing efficiency of telegraphy enabled correspondents to paint a grim picture with words that soon appeared in the press for the consumption of eager families, friends and compatriots at home under the banner of Black Week. The matter was worsened by the shipping of film reels back home, this being the first conflict in history to have been captured in moving images. Black Week was to compel the middle class to consider that finally, after decades of trouncing foreigners on their own soil, the working class men of the Army weren’t up to the task. Throughout the clubs and societies that Tommy Atkins would never be permitted to enter, was raised a class of self-proclaimed soldier that considered themselves a cut above the regulars; the Yeomanry. Of that class were a band of hand-picked doctors, financed through the high society fund raising efforts of Lady Georgiana Curzon and Lady Beatrice Chesham that set off for South Africa with the tools, materials, supplies and will to establish a hospital dedicated to the care of inevitable Yeoman casualties. 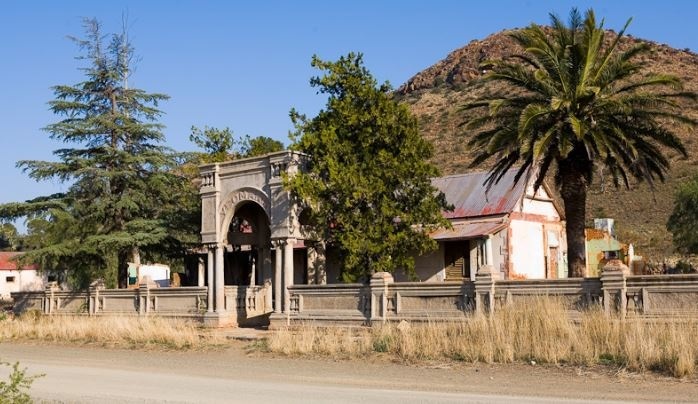 The location at Deelfontein was selected for its transport link, a ready water supply and its proximity to the thick of the action amid a semi-desert many times the surface area of Great Britain, known as the Great Karoo. The site at Deelfontein as it appears today; the now disused 'Yeomanry Hotel'. The Isle of Wight County Press of 3 February acknowledged that W.H. Brown; left Sandown on Thursday morning for embarkation for active service in South Africa. Research carried out in South Africa shows that Brown, along with the other members of the NFBU, sailed with the appointed Principal Medical Officer, Lieutenant Colonel (later Sir) Arthur Thomas Sloggett, onboard the Norman from Southampton on 10 February. Wilfred Brown disembarked his voyage of many weeks at Cape Town, the sole member of the Southern District of the National Fire Brigades Union to respond to the call (out of an eventual total of 47 men). On arrival the firemen were welcomed by Captain Hayes of Cape Town Fire Brigade. A puffing locomotive conveyed Wilfred and his colleagues along with 1,700 tons of equipment, north from Table Bay, between Paarl and Stellenbosch, through Worcester and over the Groote River and on into the heart of Cape Colony. For a young Islander of the late Victorian era the sights, sounds and smells of this foreign land may have been overwhelming; the awesome vastness either side of the carriage, low dry Karoo bushes dotted across the barren dust for as far as the eye could see and in the distance the table-shaped koppies shimmering beneath a baking sun against a back drop of the bluest sky. Sloggett was also considered ideal, as a leader of men, treating his staff as friends and always getting the best out of them having instilled in them the desire to do their very best for their Colonel. 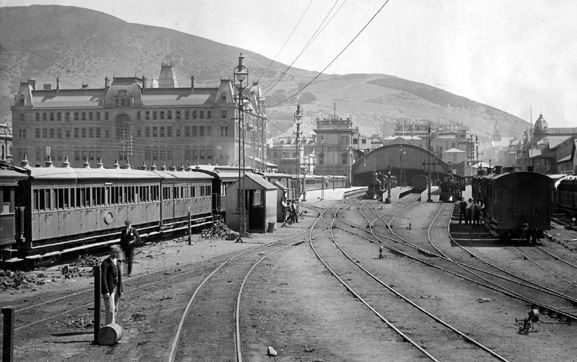 Cape Town Railway Station, circa 1900. Brown with the orderlies and nurses worked feverishly to establish the hospital along Sloggett’s prescribed lines. Two surgical divisions were established, a medical division and three specialist divisions in X-ray, dentistry and ophthalmics. For a field hospital to appear in close proximity to the scene of conflict was not original, what made the IYH stand out in history was what it was to become throughout the course of a largely, in modern times, forgotten war. Sloggett’s capacity to integrate both military and civilian specialists and to place them unconventionally but to his personal satisfaction earned him critics, but those who favoured him pointed only to the results of that hospital in the desert. Among those under his command was Florence Shore, a nurse with a formidable pedigree being niece and god-child of Florence Nightingale. The 'IYH' letters in stones placed by Wilfred Brown and his colleagues, they can still be clearly seen today. The encampment was quickly established, originally a tented village with neatly laid out pathways lined with painted stones. 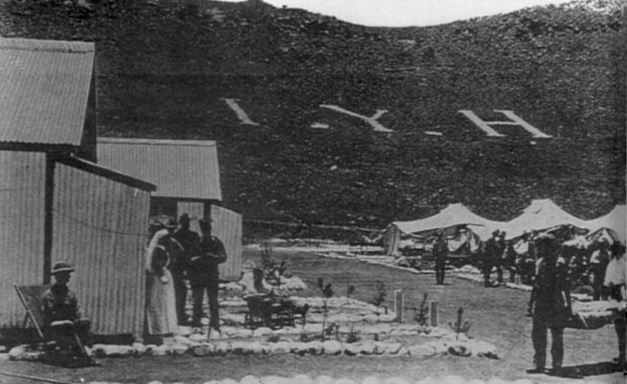 The orderlies, perhaps Brown being one, spent what spare time they had painting hundreds of larger rocks and hauling them in to position on the adjacent hillside to spell ‘IYH’ in huge letters (the letters remain perfectly visible to this day). But spare time would have rapidly diminished as the sick and injured began pouring in despite the Boer commando’s persistent destruction of the single track railway, countered at every attempt by the swift remedial action of the dogged Royal Engineers. By 1 April the hospital neared capacity, at the time around 500 beds, with Nurse Gertrude Fletcher recording of her own ward in her diary; it is only a fortnight since we arrived and all our beds our full. The men are running up fresh huts and tents as fast as they can. Another nurse made a poignant comment in her journal; When a romantic girl in my teens I used to dream of myself kneeling on the field of battle with a wounded soldier’s head in my lap as shot and shell hurtled around my heroic head. Needless to say the reality of war is different. War is ghastly grim. One needs to see it to realise the horror and cruelty. 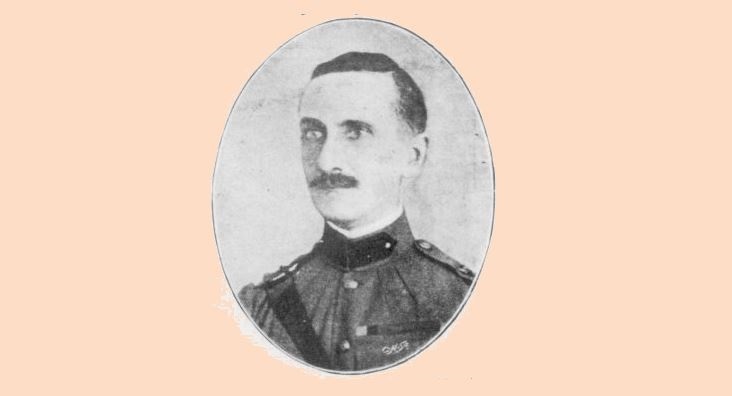 Lieutenant Colonel A.T. Sloggett; Wilfred Brown's Commanding Officer while serving at Deelfontein. As the hospital widened its doors through compassionate need to the regulars and volunteer soldiers of the army in addition to those of the Yeomanry, funding through public subscription remained the lifeblood of the hospital. The War Department were indifferent to Sloggett’s non-conforming doctrine but still held the cards to allow permission to travel to the war zone. A specialist dentist so desperately needed given the decaying state of the Tommies teeth was advised by the WD that he had to pay his own travel, buy his own food, supply his own equipment for which he would receive no salary. To his credit he agreed and soon arrived at Deelfontein. The level of patriotic commitment and compassion shown by so many was remarked upon by Colonel Sloggett repeatedly in his memoirs. He had particular praise for the men of the NFBU; these men; he said; had rendered most valuable assistance and worked with the greatest energy. Sloggett’s compassion, and subsequently that of his medical staff, stretched further than the War Department were happy with when he also began accepting enemy casualties in addition to increasing numbers of enteric sufferers and even a few cases of scarlet fever. Sloggett tasked the firemen not with putting out fires, at least not at first, but with keeping them burning continuously in order that a constant supply of hot water was available twenty-four hours a day. Whilst such routine duties were typical of the firemen’s lot, for ten of them a far more exposed entry was made to the war zone. It became necessary to form a Bearer Company, a total of 178 men, formed from various contingents from the camp staff including the NFBU. Whether or not Wilfred Brown was one of this number is not known but for those that formed it the endeavour required them to venture out from the comparative safety of the hospital grounds, safe no doubt due to Sloggett’s willingness to treat Boer casualties, and approach the front to sweep up the casualties where they fell. A rare birds eye view of Deelfontein IY Hospital; taken from a Royal Engineer observer's balloon. The efforts of the Bearer Company compelled Major Stonham of the forward Field Hospital to remark; Before leaving England I heard it asserted more than once that although civilians would prove of inestimable benefit in supplying the needs of stationary and base hospitals, they could not succeed in the more arduous and hazardous duties of caring for the wounded on the field, nor would they themselves be fitted to withstand the fatigues and hardships necessarily entailed by marching with an army to the front. The career of our Field Hospital and Bearer Company has abundantly proved that doubts such as these are unfounded and I venture to express the opinion that when the final verdict is passed upon our work even the most cautious must admit that the Field Hospital and Bearer Company fully justified the most sanguine hopes of those who equipped them and sent them out. The men of the Field Hospital and Bearer Company, on stumbling across the wounded of a previous skirmish, were rounded up and captured alongside the soldiers of the Derby Militia by the army of Boer commander Christiaan Rudolph de Wet and imprisoned. Major Stonham negotiated matters direct with de Wet which allowed the prisoners a remarkable freedom of movement to continue their medical duties until five days later they were rescued from capture by Lord Methuen’s column. Back in the camp the village atmosphere was complete with the inauguration of a series of extra-curricular activities designed to add a touch of normality. A cricket field was hewn from the rough ground across the opposite side of the track to which was added football, lawn tennis, golf and horse racing. 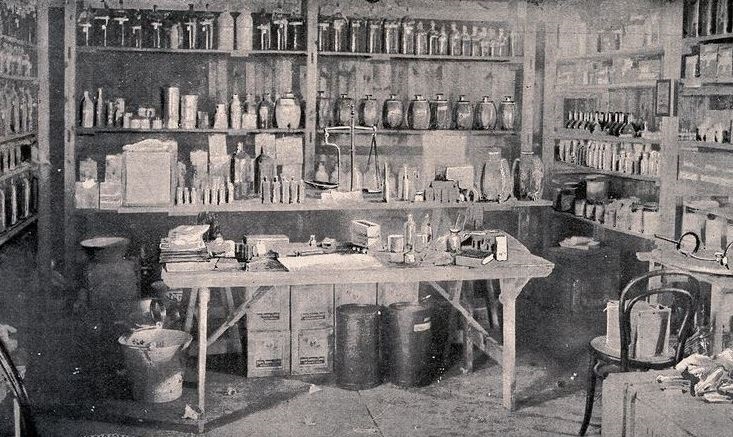 A library was established and some of the nurses created opportunities for both themselves and their inmates to participate in some arts and crafts. Concerts soon featured at the Theatre Royal as a regular break from the grim tasks of the day. The social calendar became so complex that a camp newspaper was developed. There being no printing press each copy had to be individually typed. Senior Surgeon Alfred Fripp commented; Our hospital staff is producing a newspaper... the first issue is out and is really very amusing. It caused quite some excitement in the camp and was in great demand. 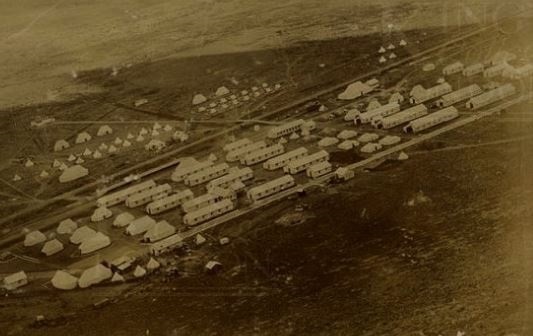 By mid-1900 the camp had expanded exponentially both in bed capacity, treatment available and amenities to support those aims which included a fire station. No records have been located to positively identify those responsible for the maintenance or use of the station and equipment, but it seems very unlikely that with a contingent of NFBU members on the roll that it wouldn’t have been them. In late 1900, at the beginning of South Africa’s summer, Wilfred Brown was going about his duties in one of the surgical division wards when he came across a familiar face; Charles Walker. Charles, born at Yaverland in 1874, son of James and Emily, was a 17 year old gunner of the militia artillery in residence at the Sandown Barrack Battery on the day of the 1891 census. Clearly a motivated young man of service by the mid-1890’s he joined Sandown Fire Brigade but left in 1899 and headed off to South Africa where, ditching his coastal artillery background in preference for a horse he volunteered as trooper 10800 of the Imperial Yeomanry. He was in a 10th battalion, but of which company of the IY isn’t known. What is known is that he was wounded in action on 6 December 1900 during the early stages of the British anti-guerrilla campaign after the conventional battles had been won and the Boers changed their tactics to a campaign of insurgency. Whilst Wilfred may have heard of Walker’s dispatch to the southern hemisphere its unlikely Walker was aware that his former comrade had followed until that day, recovering in bed from combat wounds, Wilfred appeared before him. One can only imagine the conversation and the comfort it may have brought the injured trooper to see a friendly face. Ambulance brigade volunteer Staff Sergeant John Charles Davis recorded much of what occurred in the camp from his arrival until the middle of 1901 when he too was struck down by the typhoid. In his memoirs he wrote; there was a great deal of excitement on September 25 when a fire alarm went off at 20:15. We rushed to find the Jew’s store ablaze. We managed to put it out quickly and the Colonel mounted a guard on the store until we could barricade it up the next day. He remarked on another fire of 25 October; the native kraal and two huts were totally destroyed before we could put it out. Regardless of these losses he remarked how; everyone was delighted that Deelfontein had its own fire station and fire brigade. 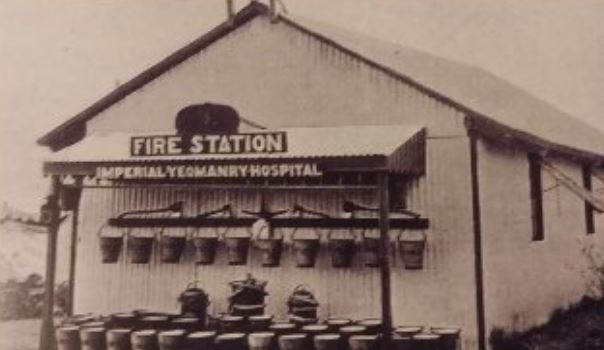 The IY Hospital Fire Station at Deelfontein. Whilst detail of the firemen’s activities is sparse the fact that Colonel Sloggett chose to mention in despatches the men of the National Fire Brigades Union collectively, is satisfaction that whatever duties they engaged were carried out as one would expect of a combination of firemen who cast aside the comforts of home to travel almost nine thousand miles and provide succour to the wounded soldiers. Deelfontein’s Imperial Yeomany Hospital, after briefly being redesignated 21 General Hospital of the Army, closed in December 1901. Wilfred Brown would have returned to the Island soon thereafter, decorated with the Queens South Africa and NFBU South Africa medals. To read the rest of Wilfred's gallant career please consider purchasing the full edition of From Victoria to the Armistice available HERE. All sale profits go direct to the Firefighters Charity.